Susie goes Best of Breed at the Greater Washington Dalmatian Club Specialty. Kenny goes Winners Dog for a 4-point Major at the Greater Washington Dalmatian Club Specialty. 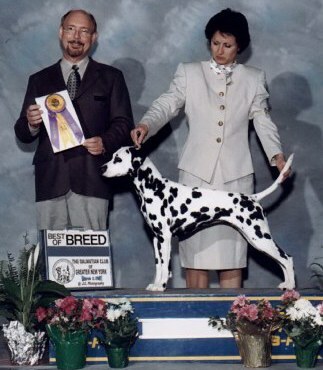 Susie receives an Award of Merit at DCA 2003, and goes Best of Breed at the WRDC Specialty following the National. report that Jodi passed away on April 14th.